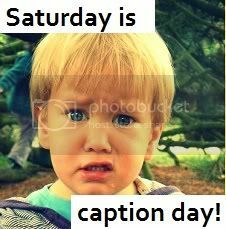 36 comments to Saturday is caption Day! I ordered a twin SISTER so this sort of thing wouldn’t happen!! The funny thing is the one splashing and laughing is the boy and the one covering their eyes is the girl! Happens all the time! “I really cannot look at it, it sounds BIG”……..
Oh my I wondered what you were going to say! I’m not looking.. I just can’t.. No No.. Don’t make me look! It is best not to look at these thing. I am trying to inform her they are ugly and not worth the bother! I cannot believe you just did that! Mum, we’ve got a floater! Oh nooo that was a stinky one! Oh no…not in the bath, that means Mummy has to fish it out! When I open my eyes you disappear,ok? That will teach you right for splashing me! Exactly, anything you can do I can do better! He he he Yes I did! Open your eyes. Go on! I promise that I won’t splash you again. I can’t believe you just did that…..Mummy will not be impressed! No she will have to fish it out! 8….9….10….. ready or not here I come! The latest shooter-shocker 3000 from the Bug. You get the shooter, I get the shocker! And she did! The bathroom was very wet!